Happy St. Patrick’s Day! Happy Saint Bernard! I love St. Patrick’s Day. This year we threw a tiny party for the kids. They each invited a friend over and we had some snacks and let them decorate our vehicles with streamers and stickers. Afterward, we headed to the St. Patrick’s Day parade in downtown Oklahoma City. I usually take between 500 and 1,000 pictures at the parade, but this year, the route changed and I didn’t have the great vantage points I’ve had in the past. Always before, the parade marched south on Broadway through Automobile Alley. This year, it marched east on Sheridan towardBricktown. Still, every March, I make corned beef and cabbage; boiled potatoes with butter and soda bread with cinnamon and caraway seed. 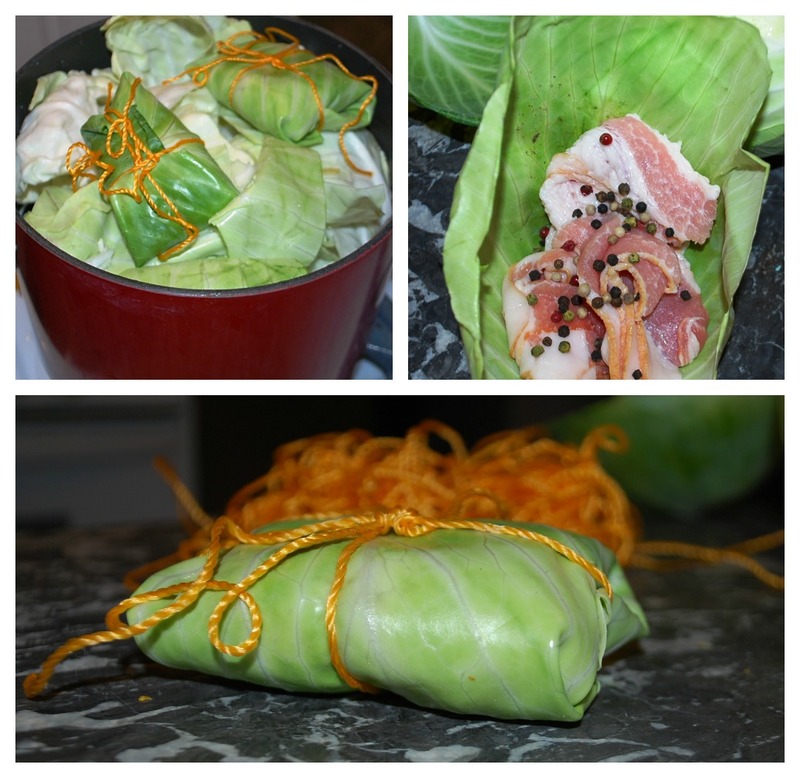 This year, I tied my cabbage seasoning up in a leaf that I made into a package. It worked really well, I just needed more of it. I’ve been waiting since August to share this picture of green and white shamrock gas pumps. These are located at the car wash on Penn Avenue and Northwest Expressway in Oklahoma City. Also, in August, I took this picture of a Shamrock, Texas road sign. We were on our way to Amarillo and Tucumcari by way of Interstate 44. 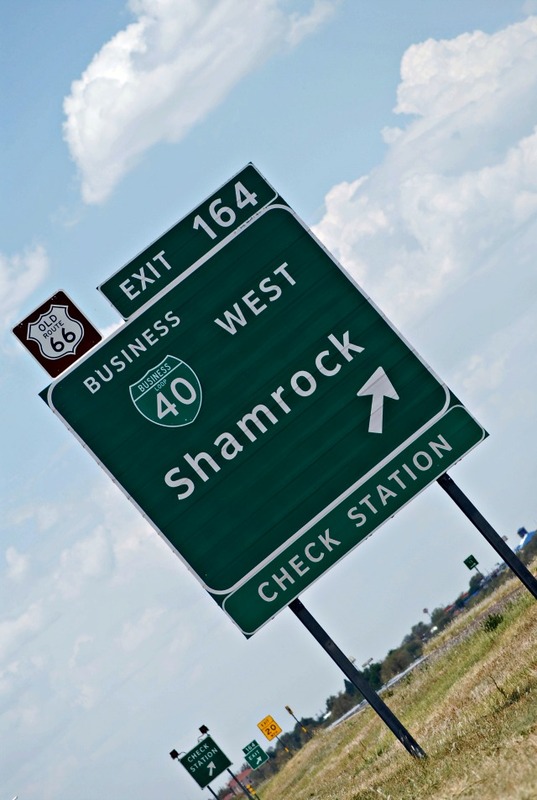 Did you know there is also Shamrock, Oklahoma? The awesome blog, Abandoned Oklahoma featured the ghost town on their site in 2009. 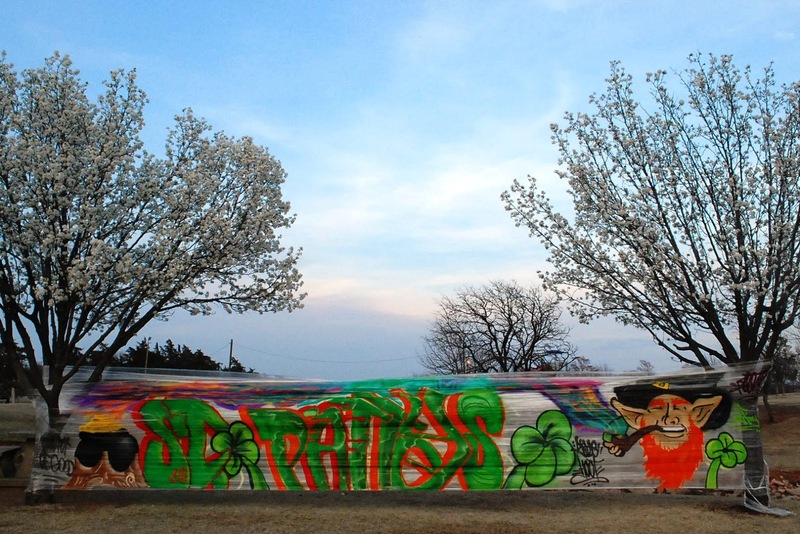 Last night, I was driving down Portland Avenue in Oklahoma City when I saw a graffiti artist at work on an exhibit in Will Rogers Park. He’d created a temporary wall of cellophane, wrapping a large, transparent sheet between two trees. It features a St. Patrick’s Day greeting, pot of gold and a leprechaun. Within the street art genre, this is called “cellograff.” The trend was started in 2006, by Kanos and Reci Xelecce when they began creating artwork on the streets of Paris without vandalizing or compromising the existing landscape. The trend has now spread all across the United States. I think it’s a terrific way for graffitists to work in the light of day; gain recognition for their talents and not in get in trouble by vandalizing public and/or private property. Their works of art are temporary and are available for everyone to enjoy. 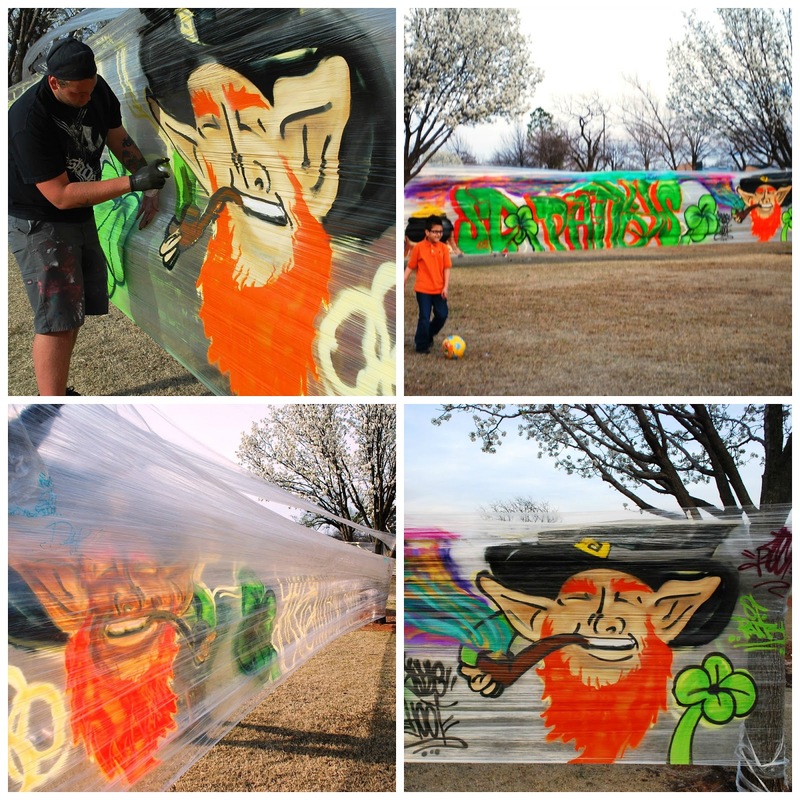 Have you ever heard of cellograff or cellophane graffiti? Does this green machine qualify as a lowrider? I spotted this last summer on Western Avenue just north of 10th Street. This car was so shiny it was practically dripping. 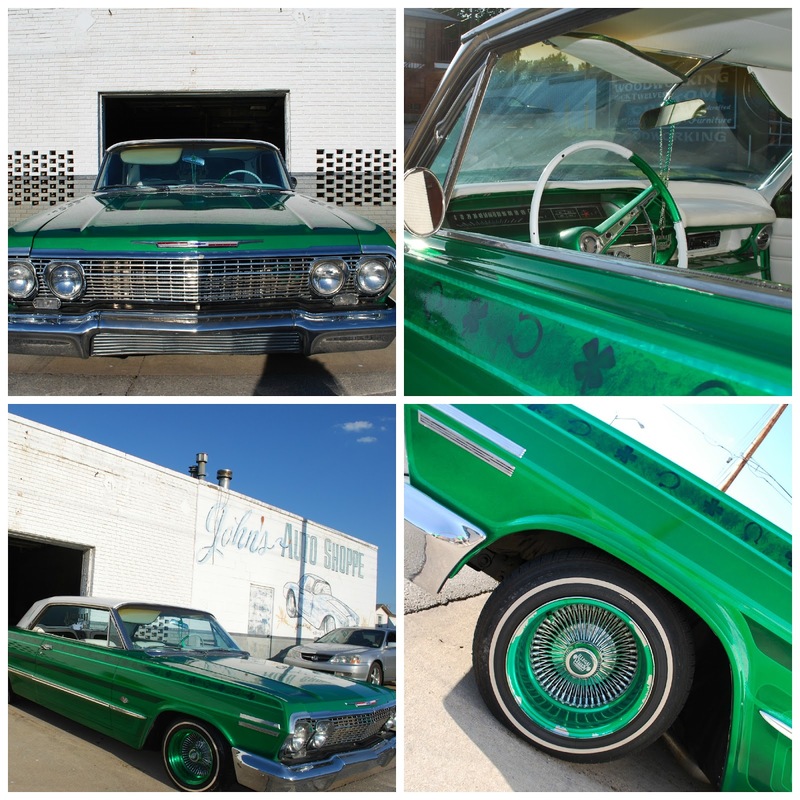 I love the shamrocks, hubcaps and wheels! Happy St. Patrick’s Day, friends! (Have you had your Shamrock Shake yet?!) May the luck of the Irish be with you all year long. So interesting! 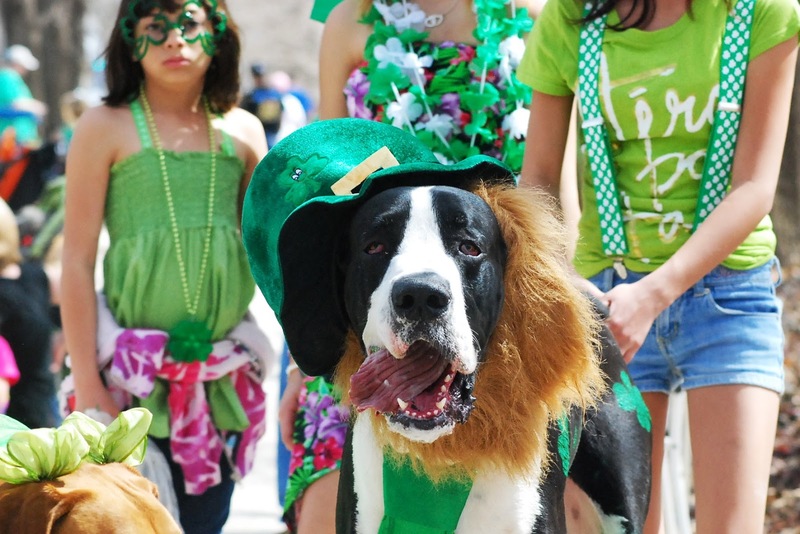 What fun St. Patrick’s Day pics. You know, I saw someone putting cellophane between trees in the square in front of the apartment I lived in in Paris, just like shown above. The only difference was that I never saw anyone paint on it all. It looked like a cool piece of installation art. But I was so happy to see this as I was wondering what in the heck was going on! Now I know it was likely prep for cellograff. Maybe they were told to take it down before they got to the “graff” part of it all.